Kaw Nation Citizens are basically the same as citizens are to other nations. This department handles all aspects of citizenship from maintaining vital records of old and new citizens alike. Not only do citizens keep abreast of Kaw Nation affairs, they also have a say in them. All mentally competent tribal citizens above the age of 18 make up the Tribal Council. Article IV of the Constitution defines how this body participates in the decision making process and impacts tribal policy. This is achieved through regular voting, holding elected office, serving on tribal boards, as well as exercising popular initiative and referendum. 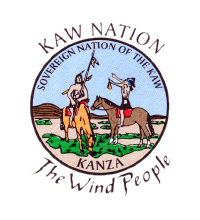 In exchange, the Kaw Nation constitutionally guarantees its citizens certain rights and legal protections. It is also the duty of citizens to inform this department of any change in their citizenship status. This can be anything from a new address or telephone number to a name change due to marriage or divorce. The first step in the process is printing out a Citizenship Application. Fill it out and mail it (with all necessary attached documentation, including birth certificate) to the address on the form. Pending a positive review and verification process, you will be issued a tribal citizen card and will begin receiving the quarterly newsletter, Kanza News. If you have moved and changed your address, simply type in the changes, email, fax or print out the Change of Address Form (pdf) and mail to the address shown on form. HOW DO I CONTACT THIS OFFICE? Office Hours 8:00 a.m. – 4:00 p.m.